Now that sports betting is legal, you can now take my advice and bet away...or at least bet away in the states that created sports books. I am looking to start strong out of the gate. Good luck to all those with a little extra riding on each game. I have a weird feeling about this year. As you saw in my predictions, I am skeptical about BC putting it all together. However, when I think about Dillon and the OL, I think we are just going to crush some teams this year. And that is really fun to watch! So let's get this started. BC Football is back and I can't wait. Addazio spent a good portion of his radio show this week talking about how tough the opener is regardless of your opponent. He feels the key is to come away with the W. I understand where he is coming from, but also think it is very limiting. Every year there are opportunities to schedule big games on the opening weekend. When he thinks he has a good team (like this year) Addazio should be more aggressive and schedule an opener that gets people excited and makes a statement in Week 1. 1. Pressure on Ford early. UMass is going to try to establish the pass early. BC needs to disrupt that and get Ford out of the pocket. 2. Run, run and then run some more. UMass had one of the worst run defenses in the country last year. BC needs to hammer them there and not look back. 3. Be careful with the ball. I only see this game being interesting if BC turns the ball over a lot. Sadly this game is not on local TV. It is frustrating that ESPN, the ACC and BC can't fix that. Wake Forest plays an improving Tulane team at Tulane Thursday night. The Deacons will be our first critical game. The Tulane matchup is a chance to see the impact of Wake's early suspensions. I am hoping Wake struggles and comes into our game a mess. Matt McDonald play for an extended time during mop up duty. The backup QB always gets to be the most popular guy around. I bought into his hype this summer, so now I want to see the kid play in a real game. Dillon gets hurt. He is the most important player on the team and the most critical player for the season. He can't get hurt in this game. We could still beat UMass without him, but it would make a winning season less likely. There may be some rust early. UMass may make a play or two. But I don't see this as close or interesting. I think we physically overmatch them and win with ease. Addazio has said we have one of the best Olines in the country. He also made similar statements about our RBs and TEs. That alone should mean a Top 25 season. Yet I have my doubts. I don't know if I trust him to navigate and push the right buttons during the season. I know we exploded during the second half of last year and we rallied in 2016. But why does it come to that every year? Can he avoid it this year? This is how I see it playing out. UMass. Win. Whipple has improved things but they are still terrible. I don't think this will be close. Holy Cross. Win. Addazio might complain about the schedule, but he was gifted two cupcakes to start the season. at Wake Forest. Win. I don't think this will be pretty, but I still think BC has enough of a talent advantage to win this game during a short week. at Purdue. Loss. I see this as a shootout. Even if Dillon goes off -- which I think he will against them -- I still think Purdue will answer. It is a road game against a rising team. I just see something not going our way. Temple. Win. Another game BC should win without a problem. at NC State. Win. Another tough road game, but I like how our D matches up against their O. I see this as relatively low scoring and BC running out the clock late. Louisville. Loss. I think this will feel a lot like the Purdue game, where we lose a game where both teams score in the 30s. Miami. Loss. As I've mentioned in the best and worst case, this game will be hyped to the heavens. I also see it as another close loss. Dillon can only do so much. at Virginia Tech. Loss. The worst game of the season. The only game where BC is not competitive. Clemson. Loss. At this point Clemson is playing with a lot of confidence and BC is dinged up. at Florida State. Win. The late season Addazio "stop the bleeding" game. I don't think FSU will be very good this year and I think we can pound them down. Syracuse. Win. I expect Syracuse to be bad this year and I think it remains a good matchup for us. This would leave BC as 7-5 (4-4) in the ACC. No major bowls for us, so we play in the Military Bowl against Navy (an unofficial home game for them). It will be an ugly struggle like our last bowl against the Midshipmen, but BC wins. Addazio finishes with his first eight win season at BC, but it feels like a letdown. This is the most talented BC team in a decade. We have elite players on both sides of the ball. Our bruising running game and enormous OLine provide a matchup problem for every team we face. It should be our year. It could be our year. If everything goes right and Addazio doesn't get in the way, this could be special. If it is special, this is how I see it play out. UMass. Win. Total romp. Not even interesting. The backups play most of the second half. Holy Cross. Win. The only thing interesting about this game is the renewal of the old rivalry. The game is terrible as BC cruises. at Wake Forest. Win. Suspensions mean we catch them at the right time. BC starts 3-0 and is finally ranked. at Purdue. Win. A potential trap avoided. BC grinds it out and Dillon has a big day to spark Heisman talk. Temple. Win. BC keeps moving up in the polls. The passing game is also clicking and BC is scoring in bunches. at NC State. Win. The D leads the way with lots of sacks and turnovers. BC starts 6-0 and is now in the Top 10. Louisville. Win. A close game, but like last year, Dillon breaks a few big ones to get the win. Miami. Win. Miami comes in ranked too. The game is a huge deal (Friday night, ESPN, Red Bandanna). BC runs over the shellshocked 'Canes. Campus is crazy. Playoff talk starting. at Virginia Tech. Loss. The bubble bursts as it has so many times in Blacksburg. A few mistakes on the road and BC can't recover. Clemson. Loss. Another wild game at Alumni that ends with a narrow loss. BC is barely in the Top 25.
at Florida State. Win. BC rights the ship and uses the ground game to control and ultimately win. Syracuse. Win. The Orange are checked out. BC cruises. BC finished 10-2 (6-2 in the ACC). Not good enough to get into the ACC Championship game and not good enough to get an at-large in the major bowls. I think BC gets an invite back to Orlando for the Camping World Bowl vs Oklahoma State. I think we win that matchup and finish 11-2 and in the Top 15. Addazio silences all his critics...including this one. Here we go again. My little preseason exercise in "what if?" There are lots of reasons to be optimistic this year, but we know things can fall apart quickly. So here is how the season might play out if nothing goes our way. Tuesday will be the what the perfect season would look like and Wednesday will be my actual predictions for the year. UMass. Win. Brown looks rusty, but BC still runs all day on UMass. Holy Cross. Win. Another sloppy game, but BC has enough talent to cruise. at Wake Forest. Loss. A short week leads to major confusion. Brown still struggles and Wake loads up to stop Dillon. at Purdue. Loss. BC can't keep up in a shootout. Suddenly the preseason hype starts turning to hot seat talk. Temple. Win. Another game that is much closer than it should be. The Offense continues to look one dimensional, but the BC D carries the team. at NC State. Loss. BC doesn't give up the big play and hangs for a while, but NCSU chips away on offense, controls the clock and the game. Louisville. Loss. A game BC should win but doesn't. There are some mistakes and now a winless ACC schedule starts to seem possible. Miami. Loss. It is a national TV and red bandanna game. BC is hyped and it is close. But mistakes hurt BC again and the passing game remains one of the worst in college football. at Virginia Tech. Loss. Another high scoring offense pulls away from BC. Clemson. Loss. BC plays well, but can't hold back Clemson. at Florida State. Loss. Another ugly game. The narrative continues that BC is "playing better" but just unlucky. Syracuse. Win. Senior Day and a positive way to end a bad season. This would leave BC at 4-8 and home for the bowl season. In my opinion it would also be time to make a head coaching change. Here is Tom Leyden talking to Dillon about the year, the "H" word and goals for the season. UMass crushed Duquense in their first game of the season and yet after the game, the first team Mark Whipple really talked about was BC. "BC is a different beast next week, not to take anything away from Duquesne. They have bigger guys who are faster. AJ Dillon will have their attention, and their two safeties. (Connor) Strachan is back. We’ll put the tape on Monday morning,” said UMass head coach Mark Whipple. Despite his struggles reviving UMass, Whipple is a smart guy and a pretty good X and Os coach. I am not fearful but I do think he will have them ready for BC. I also think he will have a wrinkle or two to keep BC on our toes. The best thing about the UMass win was that it is a reminder that College Football is back. This is random, but I came across this interview with ESPN's Ian Fitzsimmons. In it he talks about gambling on the upcoming College Football season and early bets. It can be your typical radio appearance until he gets to BC [BC talk starts at 6:50]. He loves BC and thinks we can win eight or nine. Get on the bandwagon now folks. The Herald put up a pretty innocuous five Players to Watch article and it got me thinking. Their list might be the best five but they are all the established, veteran guys. We know what to expect from that group. What I find more interesting are the players who might emerge or breakout. With that here are my three players to watch. These guys will really determine the season. 1. Anthony Brown. His health and ability to pass are the most important unknowns heading into the season. 2. Ray Smith. We are young and thin at DT. Smith needs to play well and play a lot. 3. Colton Lichtenberg. It always comes down to the kicker with Daz. If this is the year we finally break seven wins, it will be critical that Colton kick well from the start. Ohio State suspended Urban Meyer for three games for his actions related to Zach Smith's issues. That means interim Head Coach Ryan Day will get his first experience as a head coach this year. Congrats to him. Day has a long history with BC -- and this blog. While I am sure Day would have preferred his first shot at something like this under different circumstance, this is still a great opportunity. If he team performs well, Day will be a top candidate for any openings this offseason. The accelerated time table does hurt his chances of ever coming back to BC as a head coach. But if anything the coaching carousel is unpredictable and Day might still end up at BC. Addazio wrapped up his final scrimmage and the team will now start prepping for UMass. In the video below, he doesn't seem that excited, but the reports on the scrimmage were positive. Brown looked good and Dillon shined in limited action. Both backup QBs played well and the penalties were less of an issue. To an outsider, that all seems like good news. Maybe Addazio is just trying to contain expectations. Or maybe he also knows scrimmages don't matter -- UMass does. It is not where you start but how you finish. At least that is what I am telling myself as BC starts the season outside the Top 25 in the AP. After some high profile people went on a limb for BC this summer, I thought we might start the season ranked. In total BC received 18 votes, good for 34th. If the season starts well, it shouldn't take long to move into the official Top 25. BC's schedule is demanding, we face four ranked teams. Let's hope by the end of the season, we have at least four quality wins and are ranked too. The injured player that we are all focusing on is Anthony Brown, but on there is an equally important piece returning on the Defense. Connor Strachan went down early in his senior year and recieve a medical redshirt. He's seemingly healthy and back now for one final season. The upside of his injury was the rapid development of the younger players on the depth chart. Now, if everyone stays healthy, we should have our deepest and most talented LB group since the 2007-2009 days. BC provided some notes on Saturday's scrimmage without providing much info. Brown took his first live snaps and Dillon sat out. That's the only concrete news. Steve Addazio provided more of the real reaction out of the scrimmage. He didn't like it. You can see below, but it seems like neither side was crisp and there was plenty of confusion...and lethargy. When prompted to discuss the QBs, he said none were that great. We know from the write ups, that the D controlled, but Addazio doesn't really give them credit either. It is nothing to get worked up about. It is only an intra squad scrimmage. This is about working out the kinks so that the opener is crisp. Classes are still a few weeks away, but the sports season has started. The Women's Soccer team started the year off right with a win over Quinnipiac. Olivia Vaughn scored two of BC's four goals. Their season continues Sunday against Northeastern. We've seem to hit the doldrums of summer training camp. Things are no longer new and there isn't much concrete reporting or updates. If you read between the lines, the biggest news to me is that BC is not making a bigger deal of Anthony Brown's play. The returning starter is clearly taking snaps with the first team but they don't mention any of his throws. That leaves me to overthink this whole thing. Are they not mentioning his throws or completions because he is not making any or because it is so routine it doesn't merit a mention? Friday will bring more vague practice reporting. However, Saturday's scrimmage will be a big deal. If BC is still not mentioning Brown's play by then, it will be time for us to truly overthink this and worry. Someone at the ACC office must really like AJ Dillon, because they keep making highlight reel videos for him. Imagine if he is even better this year? The ACC will start producing 10-hour mini-series of those highlights. Enjoy. BC will go bowling this year. The schedule has enough wins built in to make getting to bowl doable. If Palm is right and BC has a losing record this year, I think we will have more than a bowl game to worry about. Did you see this Monday? It got a decent amount of attention and led to many people complimenting Addazio on his talent identification and development. He does deserve credit and it has been one of the things he's delivered on. But the tweet is a backhanded compliment since it also points out that despite the influx of talent, BC's record under Addazio is still under .500. He's building a pipeline that develops talent at a better rate than Texas -- at a private school in Boston -- yet is not winning at a high rate. If Addazio doesn't break through his ceiling soon, most of this will be for naught. Talent is primary and should win out in most cases. If you have talent and are not winning then you have to question how your coaches are managing the talent when it counts. Another day, another story on Zach Allen. While not at Dillon levels yet, Allen is getting attention beyond the local BC and ACC Channels. This one deals with his background in Connecticut and his intense work ethic. It will be interesting to see how Zach's play on the field changes this year, since he will be the focal point. Last year without Landry he made big strides, but was still on the field with plenty of veteran talent. This year the talent remains but it is a bit untested. Leaving Allen to fill the void and serve as a role model for his teammates. Time for the McDonald bandwagon? BC held its first scrimmage of the preseason. They didn't provide specific individual stats, but based on the write up and interviews, it seems to have gone well. Addazio voiced plenty of frustration about penalties, but other than that, seemed to like the effort. He also responded to a question about backup QB Matt McDonald and said he was one of the most accurate quarterbacks he's ever been around. This follows other write ups about McDonald's surprising and efficient play. So I ask, is it time to start the McDonald bandwagon? I like Brown and I am encouraged that he's doing better, but all this team really needs is a guy who can make good throws. With everyone trying to stop the run, receiving matchups and short throws will be open. Maybe McDonald is the guy to hit those throws and lead an offensive explosion. Even if Brown is healthy, I hope we see McDonald is some mop up duty and he turns these practice moments into real wins. BC ended the week with some good news -- New Jersey Linebacker Shitta Sillah verbaled to Addazio. He's a three star with the services and considered a Top 20 player in New Jersey. His Power 5 offers included Michigan State, Purdue, Duke, Syracuse, Rutgers and Nebraska. He's tall but not filled out yet, so maybe he could move to some sort of DE role. Welcome aboard, Shitta. New York shooting guard Joe Girard has a pretty impressive list schools. He is set to visit Syracuse, Michigan, Notre Dame, Penn State and Duke. But before he gets to most, he used one of his official visits to come to BC. The 2019 recruit has been on Christian's radar for a while, so it is nice that they've moved him from potential to a true campus visitor. Anthony Brown is the starter for Steve Addazio. As much as Daz hedges and downplays the opening battle and Brown's recovery, this is not like last year. Brown will start the first game at QB. I haven't watched practice nor do I have access to Addazio. I just know that two features on the QB in the same day (New Jersey paper | the Herald) means that is he probably ok and will the top of the depth charge until he does something to lose the job. BC posted a quick behind the scenes video, but there are full video below (with my thoughts). By way of his promotion Campanile now gets direct media time. Nothing too revealing but he does talk about Hamp Cheevers progression and his expectations of his jump in play. I always enjoy Jim Reid's media sessions because he's so passionate. Sometimes with older coaches you wonder how they connect with young players, but with Reid you can see how players would like him. Loeffler got more time and most of it was spent on Brown's development. Loeffler comes off as knowledgeable and presentable but isn't as dynamic in front of the camera as the other Coordinators. Addazio spoke for a long time. He seems pretty excited about his players and his team. He is saying the right things. The small -- but important thing to me -- was that Addazio had a shirt with the throwback logo! BC needs to make a logo switch! 1. Expectations. BC is getting national attention and votes in the Coaches Poll. This is the most preseason hype to any Addazio team. Will he use the Media Day to raise expectations or lower them? 2. Follow up on Smith. There will be a few new media members there. Will any even broach the Smith-Addazio history or just let Saturday night's statement stand? I also am interested to see how much of a push they give Dillon. This could be a huge statistical season for the second year RB. He puts up the type of highlights that the College Football media love. He's an under the radar Heisman candidate now. Does BC give him a big push Tuesday to let the local media know that Dillon is going to be a national name? Because he's been sidelined with a knee injury, we haven't heard much from Anthony Brown. Friday he spoke to the media for an extended time. He didn't reveal much, but his presence and demeanor do show a level of confidence. I hope he is this calm and confident because the knee feels good and he's ready for a big year. Addazio and Jarmond finally did the smart thing and released individual statements on Zach Smith. (It seems like the Globe was the only outlet that got the statements.) A written release was probably safer and better than making comments in front of the cameras. They say the right things without getting into the specifics of what each knew and when they knew it. It will be interesting if this is the last the two talk about it and if the national media guys start to dig into the issue and Smith's history. This is real. 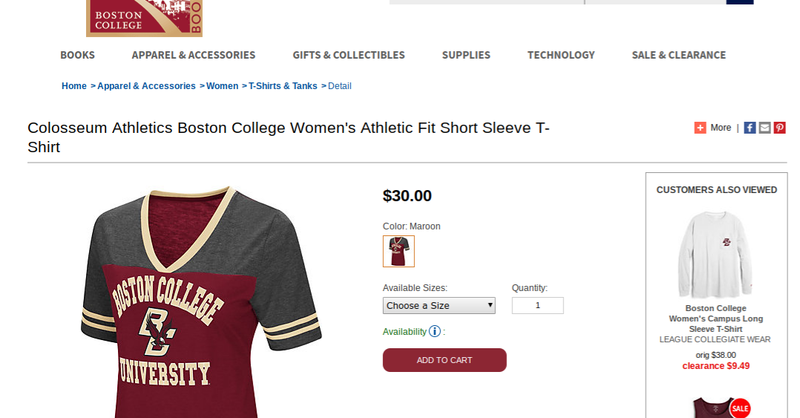 As pointed out by Heights and Lows, the Boston College Bookstore is selling a shirt that actually has "Boston College University" on it. 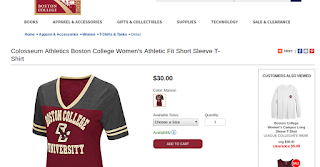 As much fun as I have with the BCU talk on Twitter, this is a big screwup by an official partner of BC. If I were to sell knockoff BC gear, the school wouldn't take long to send me a cease and desist. If I wanted to be an official partner, I would pay a fortune in licensing fees. How can a group that works so directly with BC make such a screw up? Mistakes happen. But what concerns me is that it got this far done the line. It really says that no one is paying attention to our licensing, apparel or the Bookstore. When Jarmond changes and updates our logo, I hope he has a few people who pay close attention to how it is used and that all uses help promote and celebrate Boston College. Sadly, this answer is predictable. It is also a missed opportunity. With a well-crafted, thoughtful response, Addazio could have stated something and closed his portion of this saga. Instead he obfuscated a non-answer. If he is lucky this goes away. But if this brings down Urban Meyer, look for the media to come back to Addazio and demand an answer. If he is not prepared for that, he could keep making this worse, like his buddy Meyer is doing. The fact is that Addazio can talk about other institutions. He does it all the time. He can also talk about friends and colleagues in legal or professional trouble. He has done it before. Maybe BC advised him to avoid the topic since it was not a BC issue. But it is a Steve Addazio issue. What I would have suggested is something formal and reviewed by BC's legal department that addresses his relationship with Smith. It sounds as if Courtney Smith advocated that Zach be given a second chance after 2009. That would probably provide Addazio with enough professional cover to explain the hire. It would also enable him to show respect for domestic violence, Courtney and explain what he has learned. This all might blow over and be a non-story. But if it really does take down Urban Meyer and Ohio State AD Gene Smith, Addazio better be ready for the media to hound him. And he better have a better statement prepared. If you haven't been following the Zach Smith story, here is the short version. Ohio State fired Zach Smith after his history of domestic violence incidents became public. Urban Meyer publicly claimed he was not aware of a 2015 issue. That claim is now being challenged and Ohio State has put Meyer on leave. Former BC Assistant Ryan Day is the Interim Head Coach. While this is a Ohio State issue, because of the old boys network running college sports, this story does touch BC in two obvious ways. First, Zach Smith worked for Addazio at Temple during the 2011 season. This was after Smith's 2009 arrest in Florida for beating his then pregnant wife. It would be nearly impossible in a town like Gainesville and with the type of organization that Meyer's runs, that this arrest was not known among all the football staff. I don't know what sort of relationship Addazio had with Smith then. I don't know what the Temple policy was on domestic violence nor background checks. I don't know what either Mr. or Mrs. Smith told Addazio about the abuse. The only thing we do know is that Addazio hired him after an arrest. My suggestion is that Addazio prepare a factual statement about the hire, his sympathy for the victim, how he has learned from it and how that experience has shaped his and BC's policy now. Martin Jarmond never hired Zach Smith, but he was a key leader in the department that oversaw football at Ohio State. Jarmond may be technically off the hook since he never would have been in direct position either as an AD or Head Coach to fire any of Meyer's staffers. But having seen firsthand how sweeping something under the rug hurts the victim and all those who are impacted by the coverup, should lead to Jarmond establishing a clear policy on domestic abuse issues and prior criminal arrests. He should also prepare a factual statement on the issue and how it will influence BC's actions going forward. I would like to think BC does thorough background checks on all employees. I know of past athletic staffers with DUIs who still got hired, but I have never heard of any issues related to violence that were pushed through. I suggest a strict policy -- managed by HR -- be established. Ignoring these sorts of things are never worth it and don't help the victims. We rarely take a leadership position in College Sports. Why not be the first to take a stand on something like this? Based on current information, I don't think anything Addazio or Jarmond did related to Smith would put their BC positions in jeopardy. However, that doesn't mean they shouldn't clarify their roles and explain how that will never happen at BC.